They are designed in the make and style of a motorcycle. Because of their size and stature, however, these bikes are sometimes considered mini motorcycles. Their sleek demeanor put them in the class of their own but more in line of the style of a racing bike. Beyond their looks, though, pocket bikes are meant for solid racing performance. Depending on the weight and height of the rider, top speeds on our pocket bikes range from between 30-35 mph. Our vehicles are amongst the fastest in the industry, and our long-standing reputation makes us the pioneer of this new sport. So, what comes standard in a pocket bike? For starters, our bikes come equipped either a 47cc two stroke or 40cc Four Stroke engine and a centrifugal clutch. These lightweight machines are durable and born to perform. They come standard with front and rear disc brakes and are engineered for fast acceleration. Hair-trigger throttles make for an exciting ride each and every time. Most pocket bikes are safe for children over the age of 8 years old. However, children should always ride in the company of a parental guardian. When riding a mini motorcycle, safety gear is also essential. Helmets and protective gear such as elbow and kneepads are strongly recommended. Injuries can occur, so please take caution when riding your vehicle. We want you to get the most out of your pocket bike purchase from us, but please know that safety is our primary concern. Please take a look at our pocket bike safety tips for additional information. 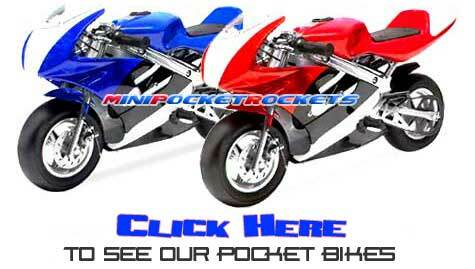 Here at MiniPocketRockets, we have sold hundreds of thousands of pocket bikes and super bikes to customers just like you. We've been offering our mini motor vehicles exclusively online for over 8 years. With our successful track record, why would you go anywhere else? We also carry a full line of OEM and racing performance parts, accessories and safety gear. Our mini vehicles meet strict quality control standards as we only deal with the best manufacturers from around the world. By doing so, we ensure that our customers get the most enjoyment from their bike purchase. In addition to our high quality control standards, our pocket bikes simply look good. Motorcycle enthusiasts have told us that each of our machines is simply a "work of art." The pictures on our site are real and are taken of our actual product you will be receiving. You can truly see and feel the difference with our motorcycles. MiniPocketRockets sells a diverse array of vehicles and colors to fit any unique taste. But, act soon. You don't want to miss this craze that is sweeping across the tracks of America. Fuel up, gear up and start your engines. You can be riding your very own pocket bike in no time flat with the fastest shipping in the industry. We'll typically ship out your bike in less than 24 hours!